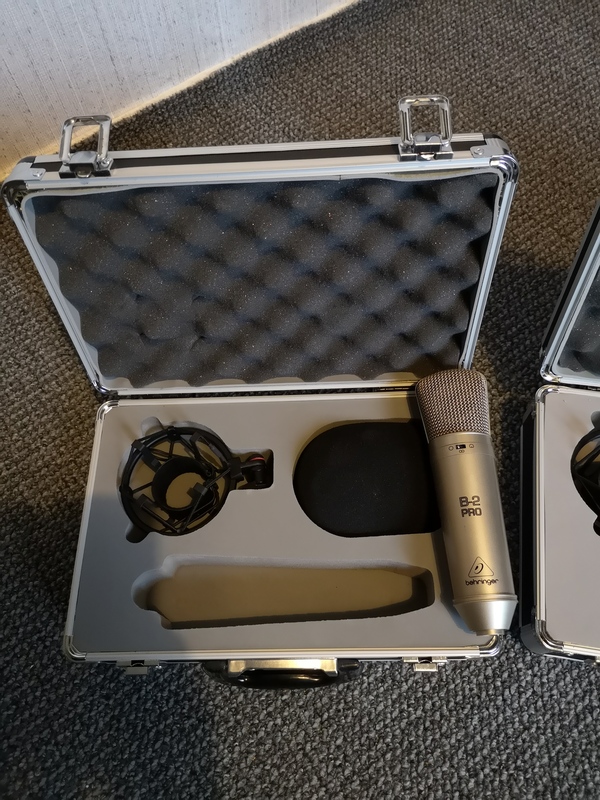 AlanForPresident's review"Affordable, but does need some work"
The Beyer B2 Pro is a dual diaphragm condenser microphone and is one of the cheapest priced microphones that will get you a good sound no matter if you use it for vocals or for instruments. 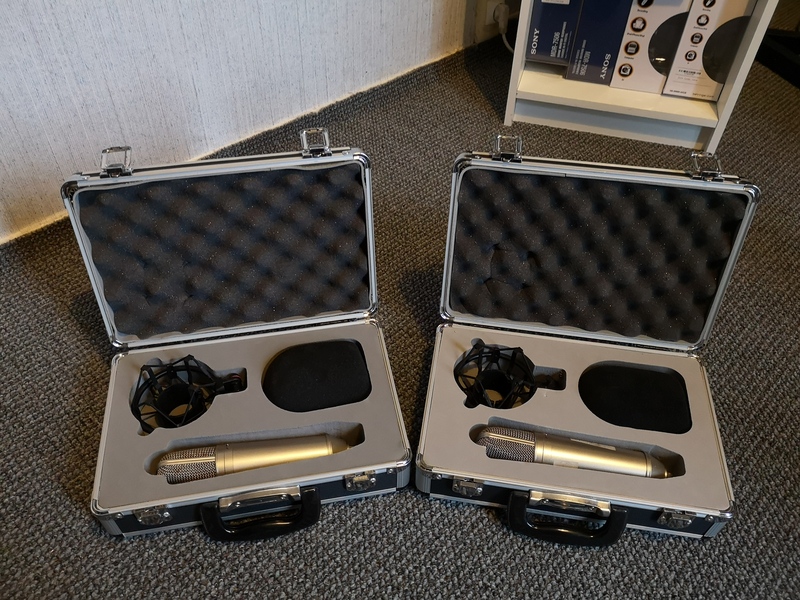 It is a pretty versatile microphone, it is a condenser so it will require a 48 V phantom power to work, unlike the other Beyer microphone that is dynamic and doesn’t require you to have phantom power. It is shock mounted and has a pressure gradient transducer. It has a great transparent sound, the sound is actually better a few of the other Beyer microphones that cost almost twice as much. When choosing a condenser microphone it will come down to exactly what you want to use it for. All condenser microphones are better in some areas and not so good in others. This microphone can be used for live vocals, but I didn’t like the way it sounded when used for live instruments. When using the Beyer B2 Pro for live instruments in a live setting, the quality of the instruments wasn’t not too good. For live instruments I suggest using in a studio setting with proper room acoustics in order to get the best sound. You will not need room acoustics for your vocals though, you will be ok with just a regular room set up as your vocals aren’t too punchy like instruments are. The quality of sound with the Beyer B2 Pro is about what you would expect to get out of a microphone in this price range. Maybe it is a little better than other microphones that are in this price range, but it is no where near where I wanted it to be. I had to invest more money for a versatile microphone that could work great in live and recording settings with vocals and with several instruments. My search for the perfect all around affordable microphone didn’t stop with the Beyer B2 Pro. I have used this microphone off and on for about 2 years before getting rid of it. It did serve its purpose while using it though. 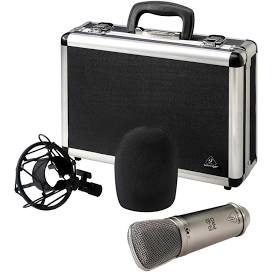 MGR/The Mind's review"Behringer B2-Pro Condenser Microphone"
I paid $200 at an online music store (I think B&H photo) for the mic to do some home studio vocal recording. For the money, less than Rhodes or AKG's similar models, and way-way less than any Blue mic, it sounds great. It is very transparent and quiet. When I went to the studio I do my mastering at, even the engineer commented on the quality of the vocal recordings. There is some noticeable sibilance around the "ess" vocal frequency, that is not quite flat. We used a software de-esser to adjust for the problem. The construction is top notch. Heavy and sturdy casing, also came with a very nice (and hard metal) carring case and windscreen. 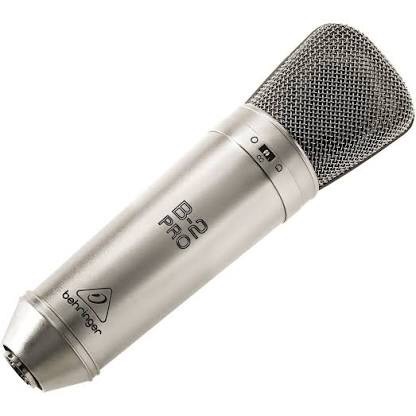 For any newbies such as myself, don't blow $800 on a studio condenser when you can record very high quality vocals with this this mic (the B2-Pro) with small amounts of necessary correction. 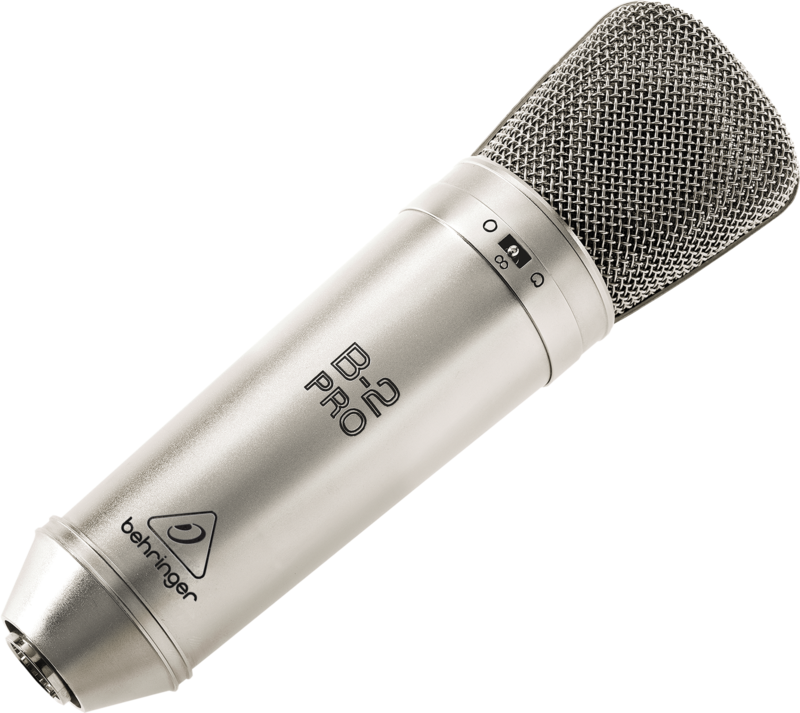 The Behringer B-2 Pro is a stereo large diaphragm condenser microphone that is designed for use in the recording studio. The mic has two separate capsules and all, along with it's own power supply and 5 pin cable. The mic has a frequency response ranging from 30 Hz to 20 kHz and has cardioid, figure eight, and omni directional pick up patterns to choose from. The mic also comes with a case and it's own shock mount. 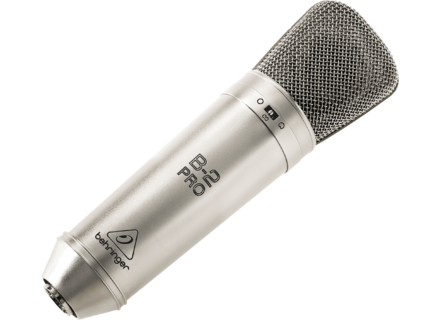 As far as stereo microphones go, you aren't going to find many of them that are cheaper than the Behringer B-2 Pro . More and more you're starting to see microphones like this for cheaper, but I haven't seen many stereo microphones going for this low price. Of course you're getting a cheaply made stereo microphones, but it's a stereo microphone nonetheless and it actually sounds pretty nice. I've only used the Behringer B-2 Pro as a room microphone while recording a drum kit, but it did a really nice job of picking up the ambient sound in the room, while giving a very nice stereo spread feel. It's nice that you don't have to worry about phasing or anything, so in the future I'd definitely like to try out the Behringer B-2 Pro as drum overheads as well. I've used a few other microphones from Behringer, but this is probably the best bang for your buck out of any of them I've used. This would be fine in either a professional or home studio, but only in a professional studio if you're going to use it once and a while. If you want a stereo mic to use on a daily basis, I'd recommend something like the Shure VP88 instead, as it sounds better and will last longer. However, if you're interested in a good sounding stereo microphone on the cheap, the Behringer B-2 Pro is the way to go. Anonymous 's review"Behringer reaches a bit too high with the B-2 Pro"
The Behringer B-2 Pro is a large diaphragm multi pattern studio condenser, and where Behringer's budget model of selling their microphones screeches to a resounding halt. It is not that the B-2 Pro is a terrible microphone; it's quite usable, and has very acceptable specs. First off, it is multi pattern, with the pickups switchable between cardioid, figure 8, and omnidirectional. It has a standard frequency response of 20-20,000 Hz, a self noise that varies minimally (based on the pickup pattern you're using at the time) around 17 dB and a signal to noise ratio that again, varies a bit around 77 dB. This makes the Behringer B-2 Pro absolutely acceptable spec wise. It also includes the 10 dB pad and the low frequency roll off. It suffers from that high frequency exaggeration that plagues most budget microphones, and while I may forgive Behringer for doing this to their very cheap microphones, the B-2 Pro has crossed the line into the territory of microphones that do not do this to the sound. There, quite simply, is no reason to buy the Behringer B-2 Pro, unless you love the sound of the low end microphones. Anyone can criticize me by saying that it's the person, not the gear, that counts, but when it comes to the Behringer B-2 Pro, I can completely agree with them (I do, anyway) and still drive them away from the B-2 Pro. You can find a bunch of microphones at this price, but if you're about to "settle" on the B-2 Pro, stop. Take a look around. There are a few magical microphones hovering around the B-2's price that outshine it in sound quality, and yes, even features.